Please, read the competition rules carefully. When you sign up for the Winter Warrior Finland competition, you accept the terms and agree to the rules. Winter Warrior ® Finland is an international OCR (Obstacle Course Racing) event. The race takes place in Pallas-Yllästunturi National Park. Duration is 2-7 hours. The start and finish of the race are at the Kellokas Visitor Center. The course goes over the mountains Kellostapuli and Kesänki and the lake Kesänkijärvi. The length of the full course that is run in the race squads is about 15 kilometers. Winter Warrior Challenge is about 10km. The age limit of the race is 18 years. Each competitor will take part in the competition at his own risk. A person of 16 years of age can participate with a written permission from a guardian. However, we recommend that young people participate only accompanied by an adult. Registration is made by a registration form found on the website. Participation fee will be paid upon registration. The paid participation fee will not be refunded, but participation may be transferred to another person. The transfer of registration must be announced by 30.3.2018 by e-mail info@winterwarrior.fi. Upon registration, you agree to the competition rules. All participant get a Winter Warrior Finland t-shirt. All racers who complete the full race course successfully get a finisher medal. The possibility of later registration or on site registration will be announced later. The Organizer reserves the right to close the registration earlier if needed. There are Warrior and Race squad for men and women. Also there is a team race for teams of minimum of 3 participants. The warrior squadis meant for serious races who are used to challenging themselves to the extreme. In the Warrior squad all obstacles must be completed successfully or you will be downgraded to race squad. We recommend participating in the Warrior squad only for those who intend to run fast. Warrior squad will get in front in possible queues. The race squad also offers a tough competition but there you can also participate the race with a lighter attitude if you want. However, the course is challenging for everyone. The fastest racers of the race squad are also awarded. Team competition is for teams of minimum of three (3) participants. Each teams races together as a team and will get one time at the finish line. In the team competition the team is the most important thing, and team members are never left behind. The best team will be awarded, not necessarily the fastest. The first racer of each country to arrive to the final part of the course will get his country flag to carry. If you pass the bearer of your country flag before the finish line, you may grab the flag to yourself. The fastest racer of each country will thus arrive to the goal as a flag-bearer and will enter the Hall of Fame of flag-bearers. The challenge squad is intended for those who want to challenge themselves alone or as a group but are not interested in competing or else want to take it a bit less serious. Winter Warrior Challenge course is shorter skipping the weary conquering of the fell Kesänki. The course length is about 10 km. There will be no timing or prizes. Except for the Kesänki tour, the course and the obstacles are the same. The participants face the same demanding obstacles but in the challenge squead the completion is always optional. Participants of the challenge squad are always obliged to dodge the race squad runners on the route. Participants must register at the registration desk before the race on the night before the race or on the morning of the competition day. Detailed instructions will be sent to the participants separately. Race start and finish are at the Kellokas Visitor Center. Each squad will have a mass start between 9am and 12pm. The participants are expected to arrive at the startline in good time, at least 30 minutes before starttime. Participation in competition under the influence of intoxicants is strictly forbidden. The timetable will be informed to participants. 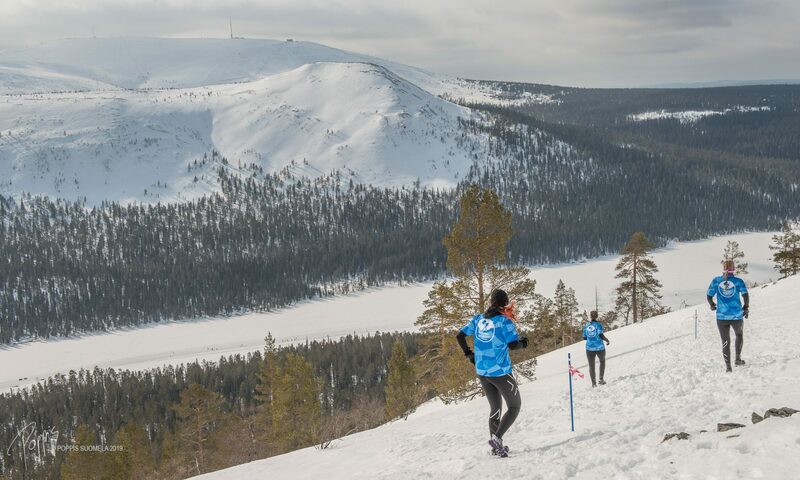 The course is about 15 km long and runs mainly in the Ylläs-Pallastunturi National Park. The route runs in mountains with high changes of altitude and deep immersing snow. There are various obstacles that must be climbed over, crawled under or crossed in some other way. The challenging terrain, snow and ice are utilized on the course and there are a lot of natural obstacles. Freezing water obstacles make sure you will get wet. The route is clearly marked on the terrain. If a participant detects shortcomings in track marking, the staff should be notified without delay. The participant must follow the marked track and follow all instructions given by the staff. In the Warrior squad, all obstacles must be completed. In the fitness squad and team competition an alternative may be provided for overcoming the hardest obstacles. Obstacles may require ability to swim. All obstacles must taken with the necessary caution, as there are risks of injury. The Organizer reserves the right to change the course and obstacles at any time. Route maps and obstacle descriptions published on a web site or elsewhere are indicative only. The organizer defines the endtime of the race, before which all participants must reach the end or drop out of the race. There may also be deadlines for reaching other timing points during the race. The organizer may discontinue any participant’s race at its discretion. The organizer may also discontinue the participant’s competition if he or she suspects that the competitor’s health or safety is at risk. A participant can quit the competition at any time. The organizer must be notified of dropping out. The participant must follow the marked route to the next obstacle or service point with staff. If a participant is injured, the co-racers are obliged to help the injured according to their best ability and forward the information to the staff immediately. There will be timing in the competitive squads and results will be publicly displayed on the website. More detailed information on the timing and instructions will be given to the participants separately. Award ceremony is held in the evening party. Any complaints must be made in writing to the organizer within one hour of the end of the competition. The competition takes place in the National Park area and all participants undertake to abide by the rules of the conservation area. It is not allowed to deviate from the marked route. Tree branches or other and other plants must not be damaged. All littering is strictly forbidden! Possible gels and other energy packs must be carried away or left in a trash bin. Littering will result in a 100€ fine and disqualification from the competition. Participants are not insured during the competition by the organizer and everyone competes with their own responsibility. The participant understands that the competition is physically and mentally very hard. The weather may change quickly and there may be up to two meters of snow. The water is freezing cold and the risk of hypothermia is real. The participants are responsible for their own health and we recommend getting a separate insurance that covers accidents in a race like this. Each participant is obliged to assist, according to their best ability, other participants who may be injured or otherwise in need of help. The participant must have proper shoes suitable for cross-country. Shoes with metal spikes are forbidden for safety reasons. Competitors can dress as they like and use fun accessories if they do not cause harm or danger to other competitors. However, it is important to take into account the weather conditions. We recommend clothes made of technical materials because they are wetted during the competition. We also recommend using gloves. You can also order a customized race shirt upon registaration ir you want. Change of clothes if important so that you can put on dry clothes immediately after the race. There is an aid station at the start and finish area and at a service point along the course. Staff along the route will alert help when needed. Cold conditions pose a particular risk of hypothermia. Never stop moving if you feel cold or start shivering. Keep moving as fast as possible so the body will warm itself. However, if a competitor is unable to continue due to the cold, there is possibility to warm up near the water obstacles. The organizer is not responsible for any personal belongings before, during or after the race. However, the organizer will try to provide safe storage space for personal items during the competition. Winter Warrior Finland has the right to save the personal information provided and use it for marketing purposes of their own and event partners. The rights of the pictures and videos taken of the event and the participants during the event belong to Winter Warrior Finland. They may be used without notice or compensation for marketing purposes. The organizer has the right to remove and disqualify any participant at its own discretion if the competitor violates the rules or behaves inappropriately.